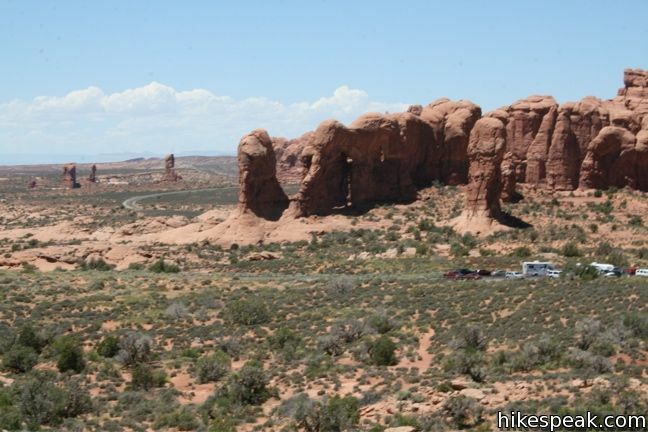 This one-mile loop visits three impressive arches in close vicinity. The North and South Window Arches form openings in the same sandstone fin, while Turret Arch stands within a more castle-like formation. 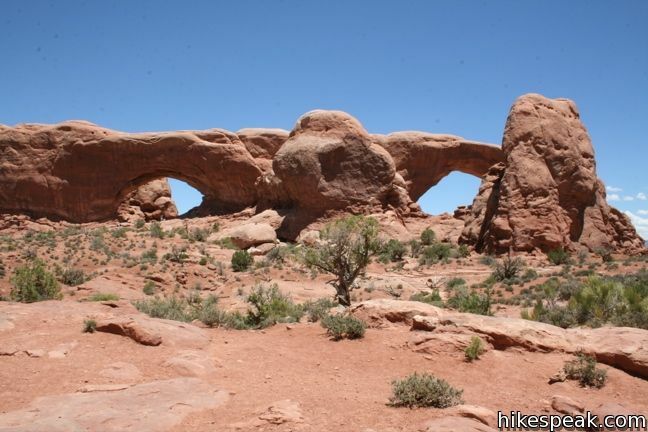 The circle between the arches has three spurs leading to the base of each arch, creating an action-packed hike with just 150 feet of elevation gain. 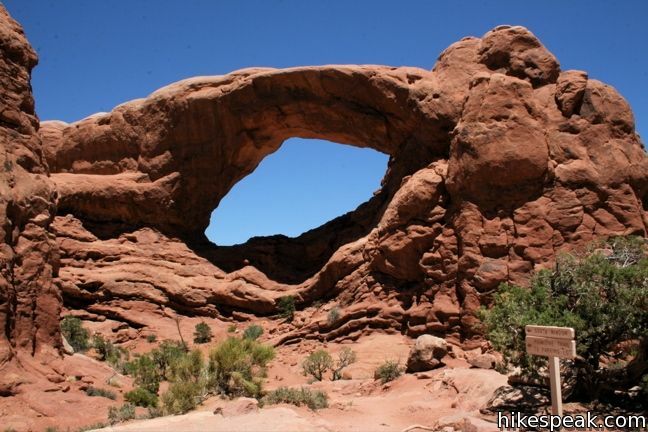 The first stop on the loop is North Window Arch. A tenth of a mile from the trailhead, turn left at the junction and continue another tenth of a mile up stone steps the base of the arch. You can stand directly beneath North Window and look out at a rustic landscape of sandstone hoodoos that lie beyond the arch. 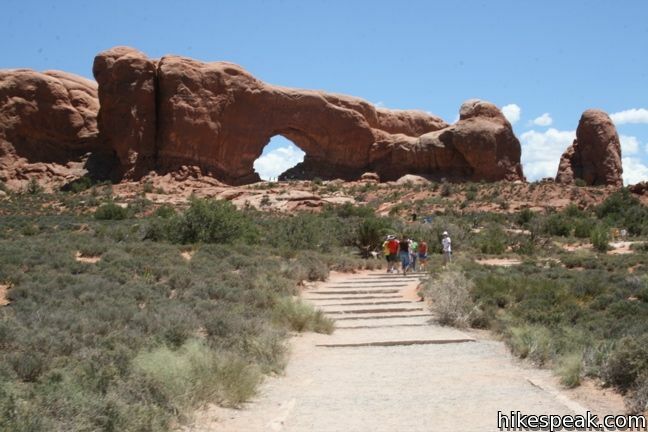 A primitive trail through this area known as The Spectacles begins at the next stop, South Window Arch. 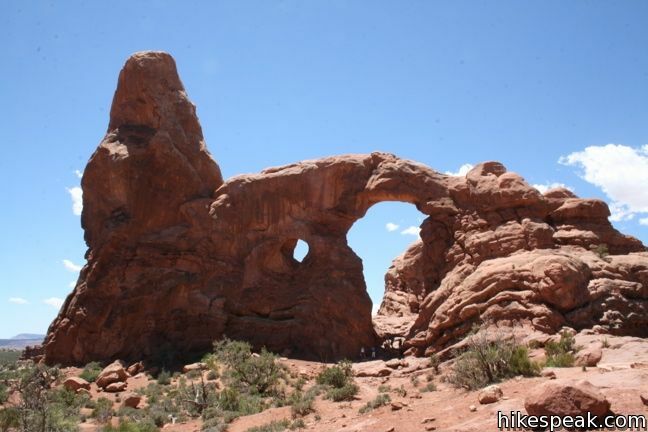 As you leave North Window Arch, catch a nice view of Turret Arch on the other side of the loop. 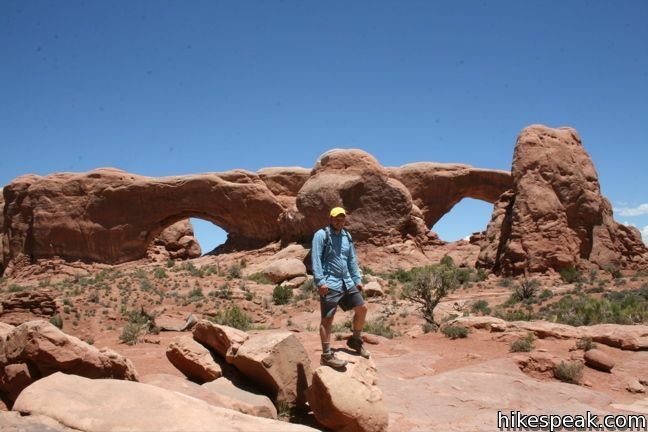 After a short distance, the trail come to a junction with a short spur going to the left to South Window Arch. 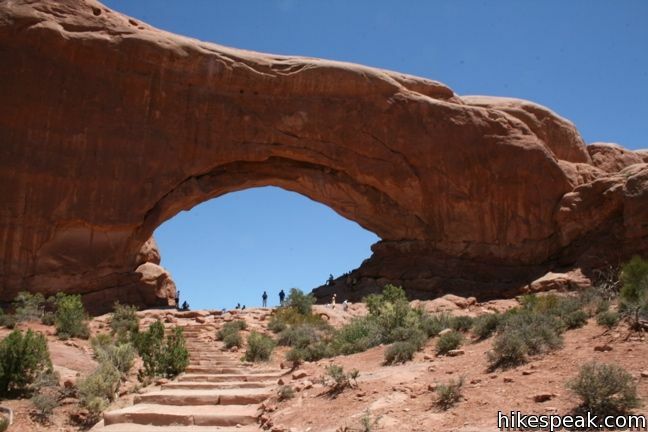 This arch is elevated from the desert floor, and the trail stops below the base of the sandstone fin. 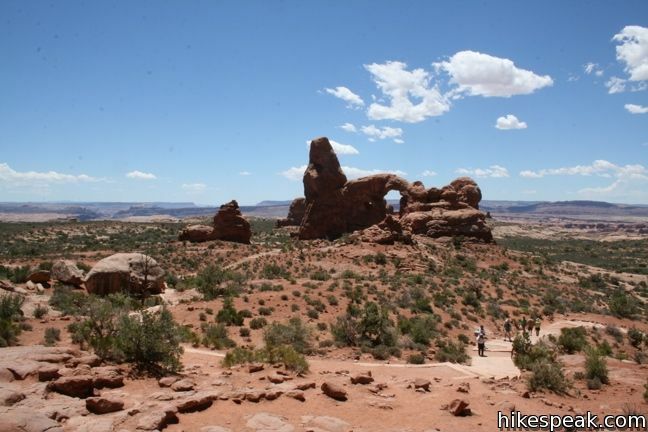 Continue clockwise around the loop toward Turret Arch, looking over your shoulder for a broad view of both Window Arches. Turret Arch is the smallest of the three. Step through the span for a view of the Windows framed by Turret Arch. 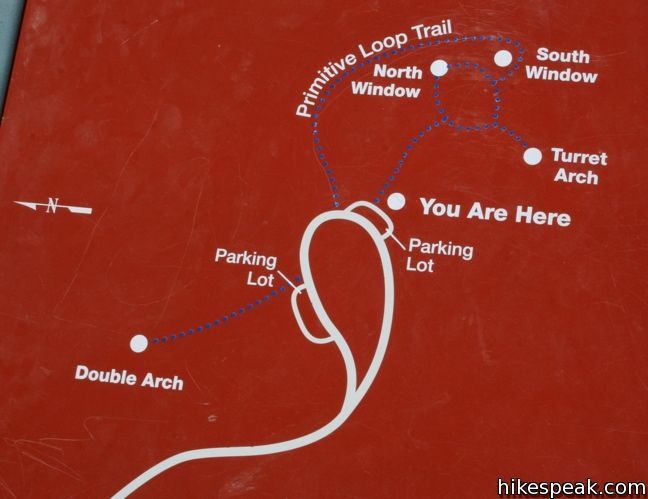 When done, proceed around the loop and down to the trailhead. 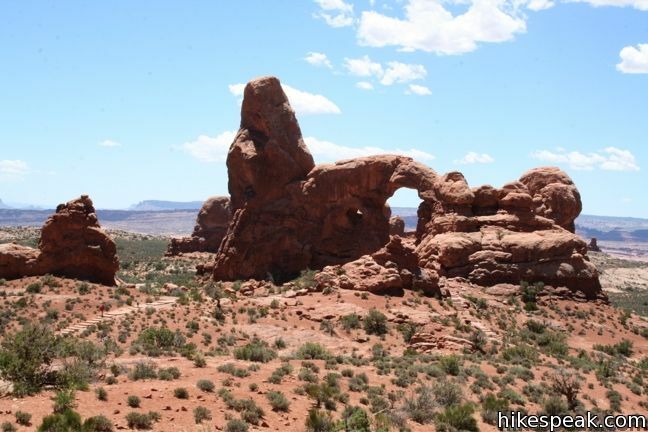 The well-marked one-mile trek makes it easy to visit three impressive arches in a short period of time, and the minimal 150 feet of elevation change makes the trail feasible for hikers of all abilities. To get to the trailhead: From the visitor center, drive 9.5 miles up Park Avenue (0.3 miles past Balanced Rock) and turn right toward the Windows Section. 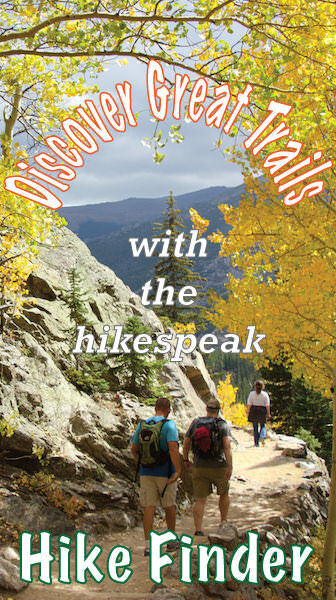 Drive an additional 2.5 miles to the loop at the end of the road where the parking area for the trailhead is located. 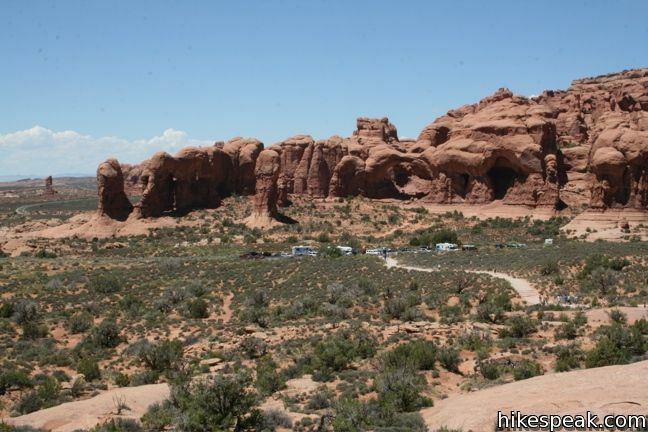 Or view a regional map of surrounding Utah trails and campgrounds. These photos were taken in June of 2010. Click to enlarge. 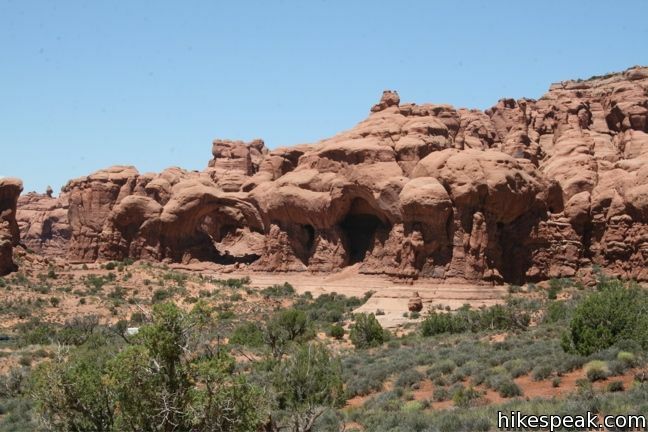 This 0.8-mile hike visits a pair of connected arches in the Windows region of Arches National Park. This 3-mile hike visits this most iconic arch in the world, a beautiful span that should not be missed. 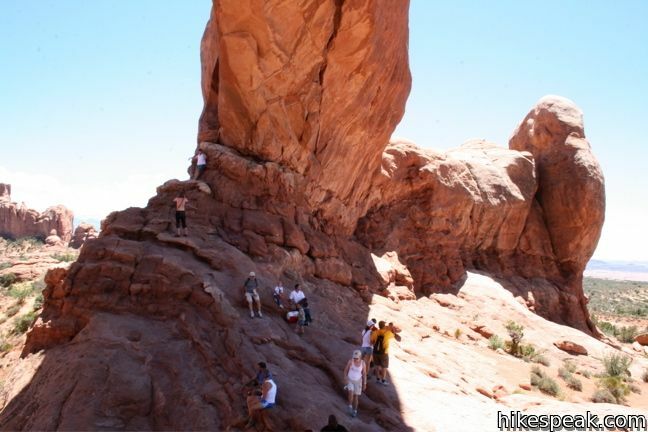 This short loop circles a perilous block of sandstone balancing near the center of Arches National Park. 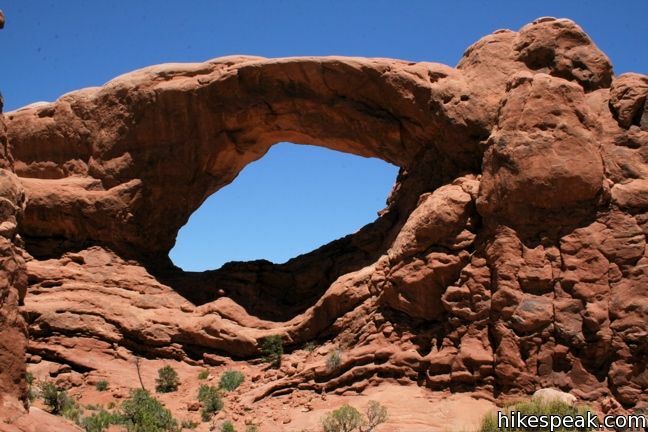 This level 2.5-mile hike visits the longest natural arch in the world along with two other enjoyable arches. 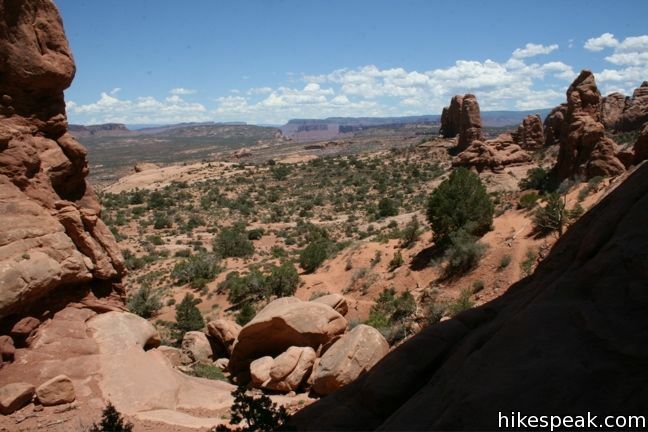 This short 0.4-mile hike ends below a wide arch near the top of a sandstone fin. 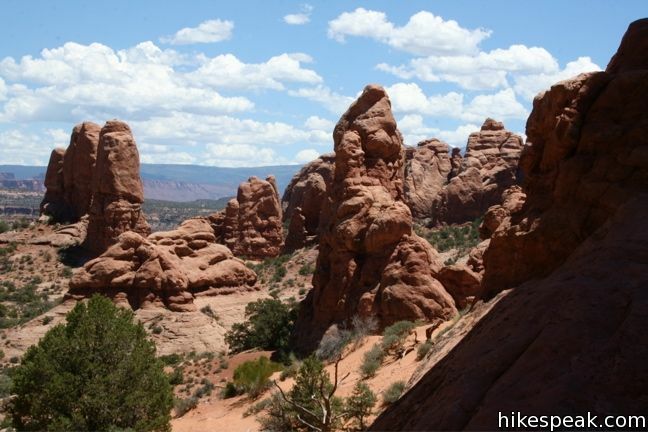 Explore other hikes in Arches National Park and elsewhere. This 0.7-mile loop visits a picturesque arch spanning across the mesa's edge in the Island in the Sky. This 6-mile round trip hike travels through a scenic canyon to a 243-foot long natural bridge.